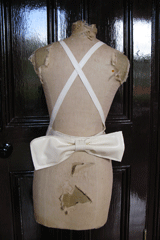 Sweetheart shaped apron with cross straps and fixed back bow. Edges frilled. Lettering not included additional charges apply.